Jimmy Fallon's first night as the host of the appropriately named The Tonight Show Starring Jimmy Fallon was Monday, February 17, 2014. Fans of Jimmy Fallon might enjoy seeing him tape this show live when they're visiting New York City, so here's everything you need to know about getting tickets in advance, standby tickets, seeing Jimmy rehearse his monologue and even tips and advice for attending the taping. 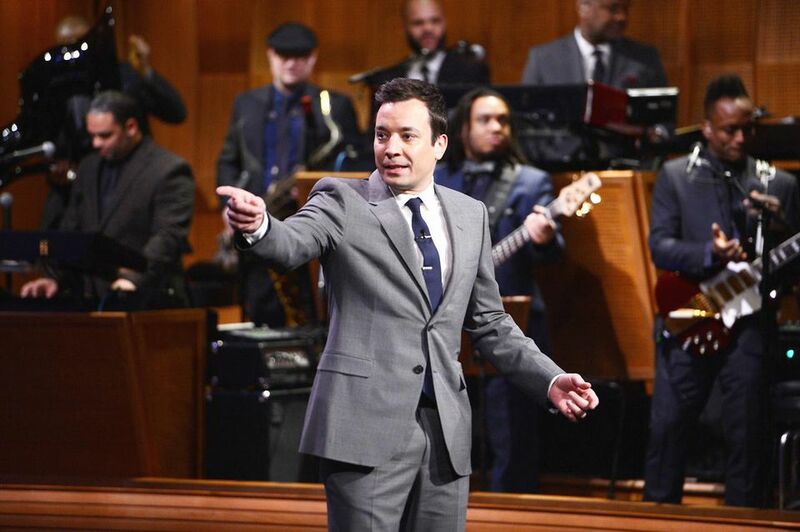 You can request free tickets to see The Tonight Show Starring Jimmy Fallon online. Tickets are generally available 4-6 weeks in advance. They release tickets in blocks, so check the website frequently to find newly released tickets. There is a four-ticket limit per request and you're only allowed to attend a taping once every six months. Stand-by tickets are distributed on the same day as the show tapes under the "NBC Studios" marquee on the 49th Street side of 30 Rockefeller Plaza (GE Building). They begin distributing one ticket per person at 9 a.m. If there are any standby tickets leftover, they will be available at the NBC Experience Store on 49th between 5th and 6th Avenues. Stand-by tickets for The Tonight Show Starring Jimmy Fallon do not guarantee admission. Call the ticket hotline (212-664-3056) to be sure that the show is taping the day you want to try and get standby tickets or you could find yourself disappointed if the show is on hiatus. You can also see Jimmy rehearse his monologue and help determine which jokes will make it into the actual show. This is a more intimate experience than the live taping. The length of time the rehearsal takes varies depending on how much material Jimmy wants to rehearse (sometimes it includes bits beyond the monologue.) Reserve your free ticket online, you'll need to register at 1iota.com to reserve your free tickets. (FYI - the interface can be a bit wonky, be patient and wait for confirmation). You can follow Fallon Tonight on Twitter for updates on last-minute ticket availability. The Tonight Show Starring Jimmy Fallon typically tapes on Monday through Friday. The Tonight Show Starring Jimmy Fallon tapes at 5 p.m. and generally lasts until about 6:30 p.m. The line-up for ticket-holders begins at 2:30 p.m. and you must arrive no later than 3:45 p.m. or you risk having your spot given to someone on the standby line. Standby ticket holders can check-in at 3:15 p.m. and begin lining up at 3:45 p.m.
You might want to check out the NBC Studios Tour—depending on the day of the week and the time of day, you might get a chance to see inside the Late Night studio.